Today’s article will take a break from the regular notebook-style and instead focus solely on profiling Timothy Liljegren of the Toronto Marlies. He’s shown a promising offensive skillset, particularly when playing against his own age group, and his lateral quickness helps him to cut off opposing forwards quite well. While he’s still not in the conversation for a NHL call-up, he’s progressing well overall for a 19-year old defenceman. Liljegren was ranked just inside of in my top 10 at the time of the 2017 NHL draft and he would have been my pick at #17. I praised his skating, hard wrist shot and confidence with the puck, and I projected him to be a valuable NHL defenceman once he got stronger. Given his age, I considered him to be a year behind the 1998-born first round defenders such as Cale Makar, Cal Foote, and Juuso Valimaki, so this was always a player who would take a while to develop. 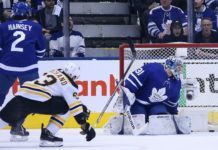 TOR picks Liljegren. When healthy, he's one of the most dynamic defensemen in yrs. However, he needs to make smarter decisions/improve def. Let’s start with the obvious: It’s rare to see an 18-year old defenceman in the American Hockey League. He could have easily been a top-pairing defender in the OHL and did not look out of place in a pro league. He was quick enough to keep up with top AHL forwards, wasn’t overly mistake-prone, and he was a valuable member of a Calder Cup-winning team. Between the regular season and the playoffs, he ended up with one goal and 20 assists in 64 games. It’s difficult to know what to make of this; while these numbers stack up well compared to historical comparisons, he was playing on a top team and gifted plenty of power play time. Ultimately, he did not look out of place at this level, but he was certainly not one of the top defencemen on the Marlies. His quickness allowed him to be a solid defender in the neutral zone, but he did not create many scoring chances, did not play on the penalty kill, and he was fairly passive overall. He was never in the conversation to make the 2018-19 Leafs roster out of camp, and while he was more dangerous offensively when he was playing against his own age-group at the World Juniors, he wasn’t exactly dominant there, either. I’m still a big fan of Liljegren’s lateral quickness and shot. He’s 6’0″ with a strong lower-half and building a stronger upper-body should help him to be a standout in terms of neutral zone defence. He could be playing in the OHL right now, but he’s quick enough to face top competition at the AHL level and fare reasonably well. My main criticisms of his game are that he’s mistake-prone, fairly weak in the corners, and often struggles with zone exits. Jake Gardiner is the perfect example of a defenceman who is mistake-prone yet effective, but he’s miles ahead of where Liljegren is at offensively. I’ve watched Liljegren put on a show with the puck on his stick against his own age group, but he’s just not taking over games yet at the AHL level. Catching up on the 3rd period from yesterday's Marlies game. If the Leafs wanted the most NHL-ready player at the 2017 draft, they never would have taken Liljegren. As I said here, if he were to make his NHL debut at the same age as Travis Dermott, it would be on May 15th of 2020. While he’s not taking over games offensively quite yet, it’s tough to expect that out of a 19-year old defenceman. His skating makes me believe that Leafs fans have a lot to look forward to. While there are certainly glimpses of his skill as a puck-carrier, there just isn’t enough consistency as of yet. Turnovers are a definite problem, so the question becomes: Can he get strong enough to protect the puck better, become more of a force on the rush, and skate it out of trouble more? He was fairly passive with the puck last season, but is slowly getting more and more aggressive. While I consider this to be a positive, it is coming at the expense of creating more turnovers. His shot is getting blocked too often, but he does have a strong wrist shot and his ability to walk the line helps to create space for his forwards on the powerplay. While he’s currently mediocre as a power play quarterback at the AHL level, he should be able to shine in this regard against his own age group at the World Juniors. Liljegren looks like a player who has spent the majority of his life playing on a big ice surface. There’s less room to beat opposing players out wide now and AHL players are faster and stronger than he’d see in junior, so he needs to improve at stick-handling through traffic. Quicker decisions are needed with less time and space; there’s less room to thread a pass through and he’s in the corners more often. He has the speed and should eventually have the strength to matchup against top competition, but he needs to prove that he’s better at zone exits than Nikita Zaitsev. It’s clear that he can fire a highlight-reel stretch pass every now and then, but completing a five-foot pass with an opposing forechecker on your tail is a completely different skillset. Went back to last year's U18 tournament to watch Liljegren play against players who are his age. We’re not at the point where we constantly forget that Liljegren is young. Jake Gardiner is strong enough as a puck mover to deserve a pass for being mistake-prone, but Liljegren’s just not there yet. We do see glimpses of an impressive offensive game and it may only be a matter of time until he starts to “take over” games at the AHL level. He’s playing against tough competition at the AHL level and now appears on both the power play and penalty kill. His lateral quickness makes him effective at denying zone entries, which is a great skill to build off of. Can he start to out-muscle his opponents on a more regular basis in the corners? Will he improve at the 5-10 foot zone exit pass? Does he get better at protecting the puck on the rush? Can he get more of his shots to the net? He’s 19, so the answer to most of these questions is probably yes, at least to some degree.